Wooden doors can have problems with locks. Depending on the problem, a carpenter will not fix it, and you would need to call a different specialist. For all other problems, and maintenance, it is best to have a specialized company in doors to take care of the problem. If you chose to do it yourself, you must be skilled in carpentry and locks to make sure you can solve any issue. Where can I find a Specialized Company in Doors in Metro Vancouver Area? Search no more. We are a specialized company in doors in the greater Vancouver BC area. We can solve any issue with your wooden doors. No matter what sort of specialization you need, we will make it happen for you. Our extensive list of same day repair services for wooden doors covers any potential problem. A cracked door and split problems are the most common damage that requires wood door repair services. These sort of problems are most common in exterior doors because they are exposed to the sun and rain. That accelerates the deterioration of wood, and makes cracks and splits a common issue. Most cracks and splits problems rarely affect the general functionality. Some of the worse cases can affect privacy. Big cracks and splits can be like a window to the other side. However, they are not big enough to let anybody in. To fix a cracked or a split door, the Carpenter just needs to apply paste. Then, the regular maintenance process like painting is required to correct the looks of the door. When a wooden door frame is kicked in, it will suffer. Most doors are not meant to be mistreated. Only when the door is too thin, a hollow core door would break. In most cases, they are very resistant, and that cannot happen. The most common damage is a dent. That is easily fixed, but if the door is always damaged, then it may seem pointless to repair it. To change the design, material or disposition of the door is recommended in such cases. Interior wood doors are rarely damaged unless they are exposed to a careless moving service. In such situations, big boxes and furniture are moved around the area. That can lead to unexpected hits. It has to be a very solid punch to leave a mark. Other less common issues are wooden door frame repairs. Unless we were talking about a break-in problem when they broke the whole door, you would rarely need to fix the structure. Old doors are commonly rotten. Especially when they had no maintenance service in years, they are severely damaged. Depending on the time and current condition it can be just a matter of paint. However, for severe structural damage, it is best to change the door. A rotten door can lead to a broken wood door easily. When moth invades the space, it is much more widespread. If it was an abandoned door that is being used again, there is a significant risk of failure. Entry doors are the most exposed because they are continuously used. Another common problem is the locks. You can call a locksmith straight, or a specialized company like us to take care of any issue with your wooden door. Let the specialists take care of your wooden door problems. 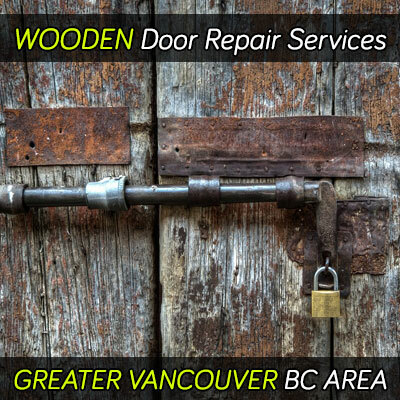 24hr Door Repair can assess any damage and offers the best solution all over the Greater Vancouver BC area (Mobile Coverage Page).